Grace Sutton (Loretta Young), who is being held in prison for a murder, is pregnant. When the time nears for Grace to have her baby, she is transferred from the prison to a maternity ward. Luckily, Nurse Bowers (Aline MacMahon) is quite sympathetic to Grace’s plight and allows her husband, Jed (Eric Linden), to visit her as often as he pleases. The two worry over how their child will be affected by growing up with its mother in prison. Most of the public thinks that Grace’s crime was justified and that the man she killed deserved to die, but her presence in the ward still causes a stir. Even more complicated than the women’s feelings toward Grace are their mixed feelings toward their own motherhood. Among those expectant mothers are Mrs. West (Clara Blandick), a mother of many children already, who thinks that babies give meaning to life and showgirl Florette (Glenda Farrell), who has no interest in being a mother and wants to give her twins up for adoption. 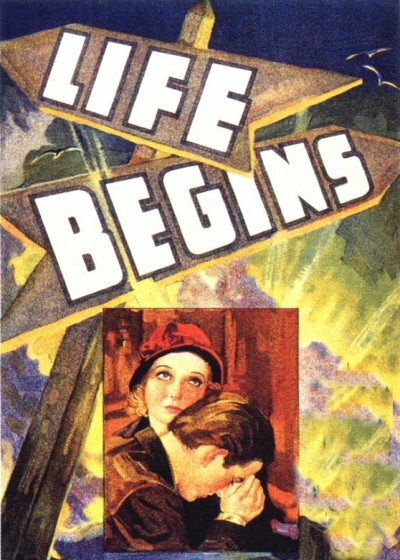 James Flood and Elliot Nugent direct 1932’s Life Begins. The film is based on a play by Mary M. Axelson. In terms of content, I didn’t expect this film to be nearly as gripping as it turned out to be. The characters are truly fascinating, and there is a lot of variety to them. The dynamics between these characters and all of their differences are very interesting to watch. The cast of this film is pretty great, and Loretta Young is particularly wonderful. Her role is obviously a highly emotional one, as the character struggles with the reality that she won’t get to see her daughter grow up. Young pulls this off very well and was the perfect choice for the lead in this film. Among the supporting performances, Glenda Farrell is the stand-out. I’m not sure if Florette was meant to provide a sense of comic relief to the film. If that was the case, I read the film incorrectly. I thought Farrell did a great job of giving her character a depth that took her from your average floozy showgirl to a conflicted woman who has lived a life with some hardship. The one downfall in terms of performance is probably Eric Linden, whose delivery gets a bit cheesy near the film’s end. The script gets very realistically sad at this point – for reasons which I won’t spoil for you – but in a few instances Linden’s performance stopped me from taking these later scenes seriously. A blonde Loretta Young! As soon as you mentioned that Grace’s husband was allowed to visit her in the maternity ward, I immediately assumed the film was going to become a ‘young couple on the run’ caper, as he helps her escape from the hospital a la ‘The Next Three Days’. Wouldn’t THAT have been an interesting left turn for the film: from mushy and sentimental to crime adventure! That would certainly be an interesting spin on it!